This has been quite the year for the Farm-to-Consumer Legal Defense Fund (FTCLDF). We would like to celebrate with you the many achievements we have made in the food freedom movement. It gives us great joy to continue to be involved in this movement and to fight for farmers, artisanal producers, homesteaders and consumers across the country. Below are several highlights of which we are especially proud. So far in 2017, the FTCLDF has received more than 650 inquiries from members seeking advice, information, legal services, or consultation, and from non-members demonstrating interest in becoming members. We expanded our interactive map offerings on our website. In May, we released an interactive and informative map, the Red Meat Map and Chart, that details a state-by-state review of custom/on-farm slaughter laws to help our members and the public navigate the complicated legislation. Click Here to view the Red Meat Nation Map and Chart. Click Here to view the Poultry Nation Map and Chart, also introduced within the last year. We worked on this breakthrough with Senator Niceley, who is a cattle farmer and FTCLDF member. The state Office of the Attorney General issued an opinion holding that, “there is no limit on the number of owners for whom a custom slaughterer may legally slaughter and process an animal or animals.” The opinion also holds that one or more of the owners of a custom-slaughtered animal can be a cooperative or association such as a food buyers club. This has made it easier for farmers to sell and consumers to purchase local meat in the state. Read more Here. We consulted on and worked with FTCLDF members on the North Dakota Food Freedom Act passed in April. The bill allows the direct sale to consumers by producers of all foods without licensing and inspection except meat, meat products, and raw dairy products; a benefit to local food producers and consumers in the state. For instance, now, under the Food Freedom Act, producers in the state can sell up to 1,000 poultry annually of their own raising without state regulation. Click Here to read more. We provided funding for the lobbying effort on the local food sovereignty bill. Maine Governor Paul LePage signed the bill into law in June; it gives control over food regulation to municipalities empowering them to allow unregulated commerce direct from local food producers to consumers within the municipalities’ borders. Read more Here. We are continuing to work on the PRIME (Processing Revival and Intrastate Meat Exemption) Act, which would empower states to set their own standards for the sale of custom-processed meat within the state. Read more Here about this important bipartisan federal legislative measure. 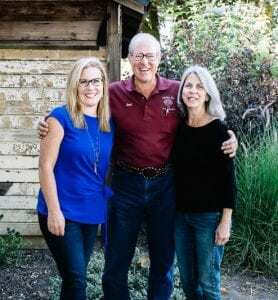 Charlotte Smith, Joel Salatin, and Elizabeth Rich, speakers at The Profitable Farm Workshop at Charlotte’s Oregon farm, Champoeg Creamery, in September. We love when we can gather with our food freedom community. This year we were able to attend several workshops and exhibit at conferences across the country, sharing the important work we do. In September, we hosted The Profitable Farm Workshop in Oregon with our speakers: America’s favorite farmer Joel Salatin, FTCLDF board member Charlotte Smith, and FTCLDF Executive Director Elizabeth Rich. The Workshop aimed to help small farmers remain in business. Helping members is at the core of our mission. Below are several stories that underscore this point. After a cursory look through her property by the Environmental Protection Agency (EPA), Debra Rock of Rock Farms was presented with a long list of violations. The FTCLDF reviewed the violations and discovered that there was no basis for their claims. Working with the client, FTCLDF helped to craft a response, and since then there have been no further issues raised by the inspectors. Often times a farmer’s objections are dismissed by regulators, and it helps to know an attorney has your back. An Arkansas farmer was issued a cease and desist letter from the Health Department regarding the sale of raw butter. After several tries to handle the case on his own, the member contacted FTCLDF’s team of attorneys. The team reviewed the case and challenged the Health Department, citing the 1943 statute allowing for the on-farm production of raw butter. The Health Department agreed that the farmer could continue producing and selling raw butter. For the last decade, homesteader Joe Grundy proudly parked his antique tractor in his front yard as an expression of his respect for the farming background of his family and his love for his country. Last summer, he received a citation for the tractor, but Grundy suspects it has more to do with the vegetable garden that he planted in his front yard to grow food for his family. The case went to trial on October 31, with the city claiming Grundy is violating an ordinance prohibiting vehicles placed in front lawns. FTCLDF attorney Elizabeth Rich defended Grundy in court. Grundy’s supporters were present in court, some of them arriving on their own tractors. FTCLDF vigorously defends the right of homesteaders like Grundy to produce food on their property, whether it be located in the country or the city. FTCLDF is a true grassroots organization with the majority of funding coming from membership fees and individual donations. Any corporate funding comes from small, like-minded businesses. Over the course of our first decade, we have defended the rights and freedoms of farmers, homesteaders, artisans, and consumers to grow, obtain, share, exchange, and sell nutrient-dense, local, sustainable, and artisanal food. We would not have made it this far if it weren’t for those of you who: read and share our posts; like us on Facebook; follow us on Instagram and Twitter; donate funds, food, or time; host events for us; and join and renew your memberships. We thank you for supporting our work and hope you will continue to do so in 2018 and throughout our second decade of protecting food choice.